Thinking of you, birthday, pick me up, or no special reason is needed to send this sweet flower arrangement. 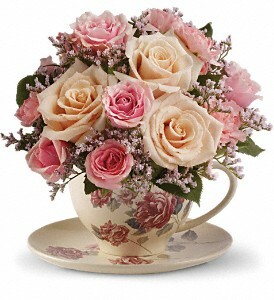 This charming, old-fashioned bouquet features a variety of our freshest flowers to match the bone china floral teacup. Teacups vary from photo.